During each of the twelve days of Christmas, the 1709 Blog is bringing readers some information concerning an author, composer, artist or creator who died in 1941 and whose works fall into the public domain in 2012 in countries which operate a "life plus seventy years" term for copyright in authors' works. Today's twelfth and final post features a founder of the Russian symbolist movement, writer, poet and critic Dmitry Merezhovsky. Dmitry Merezhovsky was born in St Petersburg into a large, wealthy and well-connected family. While studying at the St Petersburg Third Classic Gymnasium, an elite grammar school, the thirteen-year-old Merezhovsky began writing poetry and developed a passion for the works of Pushkin and Molière. Interest in the latter nearly led to Merezhovsky’s expulsion from the school, but his father’s connections protected him. Merezhovsky’s first poems were published while the author was still in his teens, and their popularity brought him fame before he even started university. By the late 1880s Merezhovsky had settled down and married the poet Zinaida Gippius, and began moving on to literary pastures new. He soon made his successful début in the field of literary criticism, and developed a whole new genre of philosophical essay as a form of critical thesis. Merezhovsky’s ideas were often regarded as scandalous by the contemporary literary establishment, and he became known as a ‘rising star’ in the growing scene of experimental literature. 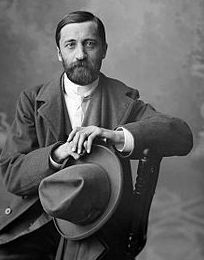 Merezhovsky co-founded the Russian Symbolist movement, and continued to publish successful novels, poems, plays and essays; Merezhovsky was nominated for a Nobel Prize in Literature on nine separate occasions, although he never received the award. Merezhovsky and his wife frequently found themselves at the centre of controversy, and in 1919 they were forced to flee their country to live in exile after speaking out against the October Revolution. As his political activism increased, Merezhovsky turned away from writing prose and focused on his unique form of religious-philosophical essay, in free and experimental style, but still under the title of ‘novel’. His works during the 1920s focused on different ways in which humankind could achieve salvation. In the 1930s he wrote about of a doomed Europe, stuck between two ‘explosive’ stores: Communisim and Fascism. Merezhovksy may have been anti-Communist, but he remained a Russian nationalist until the end. His years in exile were spent mostly in Germany and then later in Paris, where he died from a brain haemorrhage in 1941.